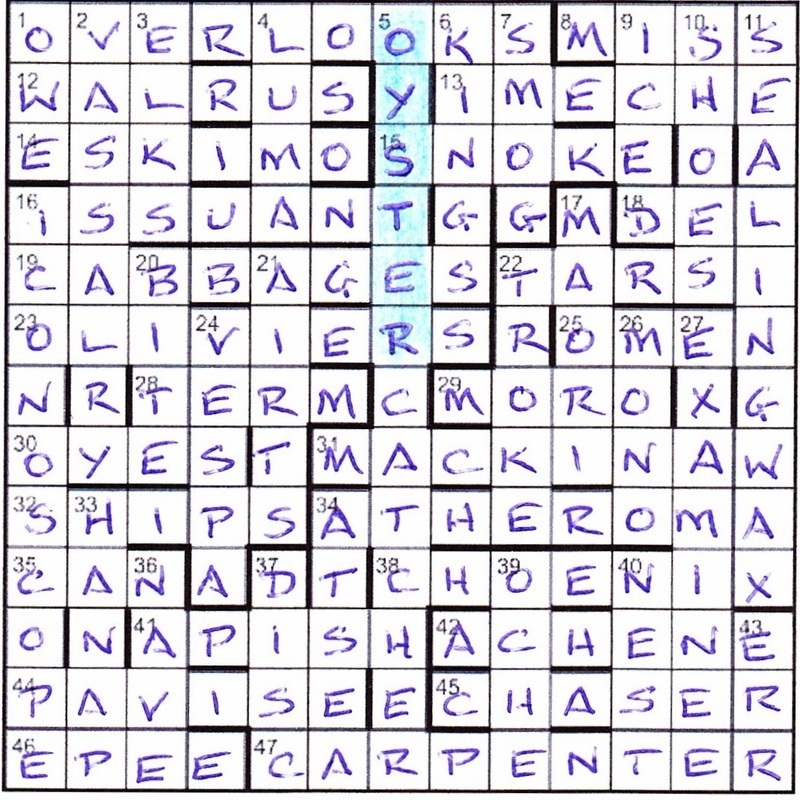 I had the pleasure of test-solving this crossword by Little Hare some time ago. I should add that test-solving didn’t provide me with an instant solution to this one this week, as Little Hare has worked on it and almost completely re-written his clues since the earlier versions I am familiar with. That’s evidence, yet again, of the hours, days, weeks, no even years when we add the editors’ input, the rewriting and the final polishing, that go into the production of a single Listener crossword. There was plenty of confirmation of Little Hare’s membership of the Listener Topers’ Club in his earlier versions, Angostura bitters, French wine and fermented fruit, but this version was ‘spiritless’ (29ac, ‘Band, spiritless, returned to Thailand = POOR< + T giving TROOP) I was rather troubled about confirming Little Hare’s membership but he redeemed himself in his grid: right at the bottom we find RED (Golden boy follows rule of law (3) = R(ule of law) + ED) See you at the bar Little Hare! Those extra letters in down clues were so subtly hidden that they didn’t at once give the game away, and we had to tease out the A E HOUSMAN quotation, “WHEN I WAS ONE AND TWENTY I HEARD A WISE MAN SAY …’ that introduce a familiar poem. Of course, for those who made a lucky guess at the theme on seeing that very helpful title, Vingt-et-un’ and teased those first two lines out of the down clues, the solving was rendered slightly easier since identifying the six items (PEARLS, RUBIES, POUNDS, CROWNS and a couple of GUINEAs) that the voice of the poem and the compiler kept, was a great help with some of the solutions, and we knew, in advance, that the HEART was given ‘with sighs a plenty’ and must disappear from the completed grid. It wasn’t all so easy though. Surprisingly (or perhaps not as I usually find it to be the case) it was the shorter solutions that were tough. ‘One following from map (3)’ giving FACE minus F(ollowing) = ACE’, ‘Spades pulled from ridge on European island (5)’ giving CREST less S(pades) +E(uropean) = CRETE, and the most original and ingenious, ‘Spin first in low court (3)’ giving MOO with its first letter ‘spun’ = WOO. I don’t think I have seen that device used before – brilliant! The entire puzzle was, as I said before, elegant, and a joy to solve. Many thanks, Little Hare. KevGar’s previous puzzle, no. 4353 Ghost Story had us tracing out the letters of “Timeo danaos et dona ferentes” in the shape of a chess knight. As I wrote at the end of my blog, “A pretty easy puzzle but good fun.” It had nice, straightforward clues like Adult swallowed up by hard drug — cry of dismay (3) for HAH… which the annual stats obligingly informed me that I’d carelessly entered as HUH. Shameful!! This week, “Clashes in several cells must be resolved to show items that relate to a particular conversation.” I put on my clash-proof hat and started solving. A dozen across entries later and I was feeling smug. Sadly, 1ac wasn’t one of them, but 8, 12, 13 and 19 were, all near the top. I proceeded to solve nearly as many down clues, including OYSTER-CATCHER in the middle. An enjoyable ninety minutes of solving followed, some time being spent on trying to see why Rare snakes close together, shut up inside (9) led to CARPENTER. It didn’t take to long to see that 12ac could be WALRUS, and we were in Lewis Carroll territory again with one of my favourite bits of nonsense from Through the Looking-Glass. 11dn was obviously the SEALING WAX, but it took me a bit of time to suss the true result of Old city pollution enveloping lake, almost rank (10). It was nothing to do with ‘smog’, but STALINGRAD (L in STAIN + GRAD[E]). And the CARPENTER had started out life as SERPENTRY (PENT in SERRY). So finished a nicely constructed theme. As I said last time, “A pretty easy puzzle but good fun.” Thanks, KevGar. I’ll be checking my solution this week rather than waiting to be surprised by the annual stats! There was a sigh of relief when this week’s grid looked normal (not last week’s slanty thing) and had clue numbers and no mention of jumbles, misprints or missing or extra letters produced by the wordplay. Sure there were going to be clashes in several (unspecified number – oh dear) cells and we had to highlight ‘six cells whose contents, if removed, would represent the position at the end of the conversation’. We had a suspicion already, that was speedily confirmed when SEALING WAX filled the light that shortly appeared at the right of the grid. However, first of all, I needed to confirm KevGar’s continued membership of the Listener Alco Downers and that took a moment.’Echo reckless with spirit – ancient Greek measure (7)’ gave us ECHO* = CHOE + NIX which Mrs Bradford told us was a Greek measure. Three clues further down, he was into a different drink, ‘Different drink to follow tea series (6)’ which gave us CHASER, and we found a ‘Goblet, Chinese apparently (5)’ HAN + AP = HANAP, so membership confirmed. As I skimmed through the clues, the other Numpty was slotting answers in as fast as he could read, almost, and the grid was quickly three-quarters full with OYSTERCATCHER appearing down the centre – a generous compound anagram ‘Story teacher made up about tale of exotic bird (13)’ STORY TEACHER [exoti]C* and, with CARPENTER obviously filling the light where we had C?R?E?N?T?R, we found lights where we could insert WALRUS, CABBAGES, SHIPS and SHOES and KINGS, since we were clearly on familiar ground – or a familiar beach, I should say. All the same, I have to agree with Alice that ‘They were both very unpleasant characters’ even if they have entertained us and become part of most people’s literary vocabulary. I should imagine most solvers twigged the theme very quickly and filled at least one of the lights without working out the wordplay of the original solution, which was clearly not KevGar’s intention. We had just one light left, 28ac TER?, ‘Bust brawling woman, suppressing a yawn at Ibrox (4)’. Mrs Bradford told me that TERM is a word for ‘bust’ and that ‘a yawn’ is A GANT, so we had a full grid after a little over an hour. Not just a full grid, but a degree of anxiety and befuddlement, since, shock horror, we had a handful of clues we hadn’t solved. We could highlight the poor OYSTER victim of the verse (a pity that KevGar couldn’t somehow remove him leaving real words) with sadness that those young things were so gullible, and, with no feet, walked a mile or so to ‘converse’ about subjects that really could have borne no interest at all for them. It is too risky to ‘solve’ a Listener crossword without understanding all the clues, so we had to laboriously backtrack to discover, in all, 21 clashes. We had already spotted that MIFF (Become annoyed with note played very loudly’ MI + FF) clashed with SLOES (Fruit delays, reportedly) but now had to find ‘Old city pollution enveloping lake, almost rank’, which gave us STAIN around L[ake] + GRAD[e] = STALINGRAD, producing four clashes with SEALING WAX. Obviously SERPENTRY (‘Rare snakes close together, shut up inside’ SERRY around PENT) gave us four clashes with CARPENTER. RINGS becoming KINGS had appeared on our first run through but we had a struggle to find HERBAGED (New Hebrides, half forgotten, old and grassy = HEBR* + AGED) to give five clashes with CABBAGES. TAURUS becoming WALRUS wasn’t so difficult but the one that really challenged us was SHIPS. Clearly our VESTA had to become VESPA but that left me a rather vulgar SHITS at 32ac and I have confidence that our editors would have drawn a red line through that. Of course, I didn’t have to solve the clue but later, a friend kindly told me that SLIPES are ‘runners’. There’s my new word for the week! Many thanks to KevGar. I am a great Alice fan. Carroll is a wonderful source of material for setters isn’t he, and, as usual, this produced an endearing and entertaining theme. Well, this was Tibea’s second puzzle. Popularity Contest was the first two years ago, and required More like this to be written under the grid. This week we had a puzzle that was definitely not like that, but more like some of the old missing-word narratives from the 60’s and 70’s. In fact, it was missing words and hidden jumbles. I suspect that any novice solver who had a look at this probably wondered what all the Listener fuss was about. Of the four extracts from The 22SEs from 1991, I only recall the first, A puzzling home for a pondokkie by John Grimshaw, which heralded the appearance of the Listener crossword in its new home, The TIMEs (22SE). As I quickly slotted in a lot of the missing words from that article, I wondered how much knowledge of the history of the puzzle was necessary to finish this one in a reasonable time. Not that I had any knowledge of Sir Charles Irving’s sale of House of Commons whisky to a Japanese company, but it was obvious that he must have been CHAIRMAN of the Commons catering committee. In the ‘pondokkie’ extract, the only word I couldn’t put in the grid straight away was 26NE DEVOTEES. Once the obvious missing words were entered, the rest of the grid became a bit of a slog (and double-checking it even more so). The only slight hiccups I had along the way were putting SORROW at 8SW (instead of HORROR) and TREMOR at 14NW (for TERMOR). I’d also not heard of FEWTER, HALIERS or HOONS before. I must admit that, if I didn’t have Listen With Others duties to perform each week, or if I wasn’t hoping to beat my longest run of all-corrects, I probably wouldn’t have bothered with this one. As it is, I do have LWO duties, and I am hoping to beat my run of 126. I’m guessing that the grid must’ve been a real bugger to compose, and probably an equal bugger to check and make sure that nothing had been overlooked. Indeed, was the ambiguity (FAST/RAST at 35SE) accidental or intentional? 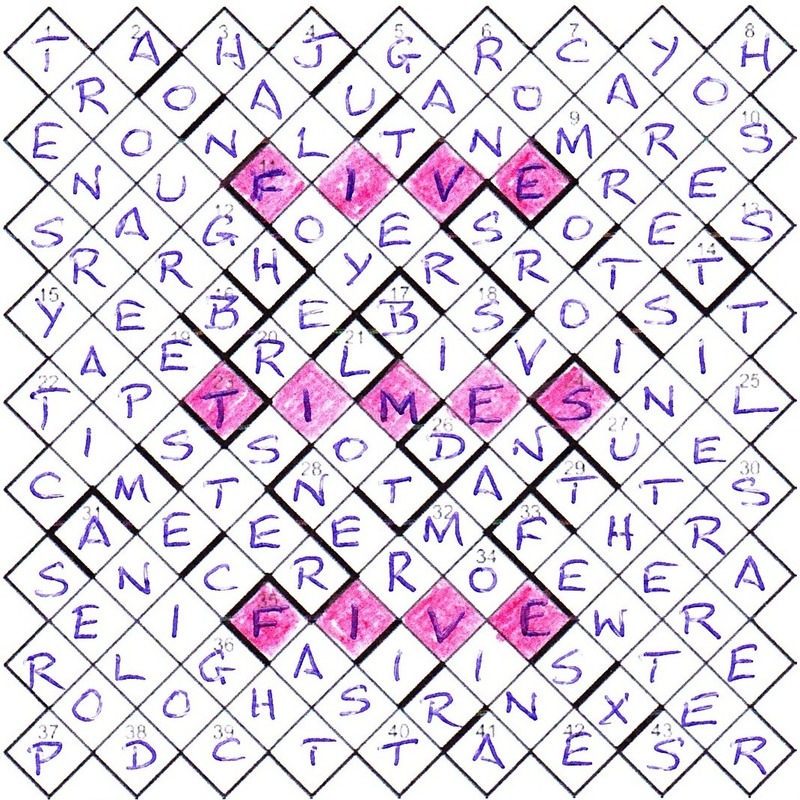 Knowing the two TIBEAs, I’m going with intentional, resolved only by the FIVE TIMES FIVE needing to be highlighted in the finished grid. I look forward to seeing how this fares in the annual stats regarding number of entries received. I would also be interested to know how many gave this experiment the thumbs up. I’m afraid that I am not one of them, but that’s not to say it wasn’t worth a try. Yes, of course (as if there was any need to!) I checked that Tiburon and Kea have retained their membership cards of the Listener Tippling Gang and they emerged as honorary founder members with that entire anecdote, Altruism in a glass, recounting the sale of a £45,000 consignment of 12-year-old House of Commons own-brand Scotch whisky with the comic line, ‘While delighted by the prospect of the deal, the gin-drinking MP was unable to add a personal recommendation. “I never touch the stuff,” he said,. “It makes me feel sick.”‘ One has to wonder what the other MPs who do like the stuff thought! We poured ourselves a measure and began to hunt for jumbles to fill the rest of our grid. Cheers, Tibea! I can’t resist commenting on the lovely coincidence with today’s news. We have just learned that the Inquisitor series will not die with the print version of the Independent – ‘It is inconceivable (to borrow words) that a puzzle with such a following should be allowed to die with its magazine’ and we are delighted that it is appearing from today in the Saturday I. Thanks to Tibea for an enjoyable and very different challenge.